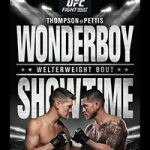 The Ultimate Fighting Championship made its way to Bridgestone Arena in Nashville, Tennessee tonight for UFC Fight Night 148: “Thompson vs Pettis.” The event was headlined by a featured welterweight bout between Stephen “Wonderboy” Thompson and Anthony “Showtime” Pettis. In the heavyweight co-feature, Curtis “Razor” Blaydes battled Justin “Big Pretty” Willis. John “The Bull” Makdessi met Jesus “El Mudo” Pinedo at lightweight. Jussier “Formiga” da Silva faced Deiveson “Deus da Guerra” Figueiredo at 125. MMARising.com has live play-by-play for the card. Thompson used kicks to keep out of range of Pettis’s punches in the opening minute. A three-punch combo and a body kick landed for Thompson and Pettis fired back with a hard leg kicks. Both men landed kicks to the body and Thompson rushed forward with two flurries of punches. He landed another combination soon after and Pettis answered with a nice right hand. Thompson bloodied Pettis’s nose with a jab and he followed with a leg kick. Pettis landed leg kicks of his own and Thompson connected with a one-two late in the round. 10-9 Thompson. Thompson went high with kicks in the second round and then resumed targeting Pettis’s lead leg. More leg kicks and a lead right hand landed for Thompson as Pettis’s nose began to bleed heavily again. Thompson picked his shots with punch-kick combos and prevented Pettis from landing much of anything in return. Pettis finally landed a trio of side kicks to Thompson’s lead leg and he followed with a straight right hand. Thompson returned fire with body kicks and a combination. He continued to control the striking exchanges until the final 15 seconds when Pettis unleashed a devastating Superman Punch. An unconscious Thompson went crashing to the mat and Pettis landed two follow-up shots before the fight was waved off. Winner: Anthony Pettis by KO (Superman Punch) at 4:55 of round two. He improves to 22-8-0. Blaydes wasted no time in trying to take the fight to the mat, but Willis defended well and stayed on his feet. Blaydes continued to pursue the takedown until he was able to get Willis down near the base of the cage. Willis gave up his back and Blaydes threw knees to the thigh before suplexing Willis down again. More knees landed for Blaydes and he dumped Willis to the mat for a third time. The process repeated itself once more in the final minute and Blaydes landed left hands to the side of Willis’s face. 10-9 Blaydes. A big right hand rocked Willis in the second round and Blaydes landed another punch before slamming him down to the mat. Blaydes moved to mount and dropped occasional punches and elbows from the top. Willis looked for a kimura from the bottom and Blaydes easily escaped by landing elbows. Wilis stood and Blaydes dragged him down again. He spent the remainder of the round landed short left hands from back control while keeping a kneeling Willis pinned against the base of the cage. 10-9 Blaydes. Blaydes opened the final round with a leg kick and that set off an exchanges of power punches. Little transpired for the next minute until Blaydes shot in for a takedown after landing a short right hand. Willis stayed on his feet and Blaydes threw occasional knees to the thigh. The fighters separated and Blaydes took Willis down into side control. Willis gave up his back and Blaydes landed punches to the face and knees to the thigh until the end of the fight. 10-9 Blaydes. Winner: Curtis Blaydes by Unanimous Decision (30-27, 30-26, 30-25) after three rounds. He improves to 11-2-0, 1 NC. Makdessi kept his distance and threw single kicks to Pinedo’s lead leg and body during the first half of the round. Power punches were exchanged and Pinedo became more aggressive with his own kicks. Both men landed kicks and Makdessi scored with a short left hand after Pinedo lost his balance. A punch-kick combo landed for Makdessi late in the uneventful round. 10-9 Makdessi. The second round began with Makdessi continuing to target Pinedo’s lead leg with kicks. Pinedo refused to commit to any sustained offence and Makdessi picked his shots with single kicks and punches. Pinedo finally landed a one-two, but Makdessi remained the aggressor and he landed kicks until the final minute when Pinedo suddenly picked up the pace. Pinedo landed a flurry and a head kick that backed Makdessi up, but Makdessi recovered quickly and he landed kicks before time expired. Closer round. 10-9 Makdessi. The fighters circled and exchanged sparse strikes in the final round. Makdessi chopped away at Pinedo’s lead leg as referee Herb Dean warned Pinedo for inactivity for the third time. More kicks landed for Makdessi and Pinedo finally scored with a lead right hook. Both men connected with one-twos and Makdessi followed with a lead left hook. He countered a body kick from Pinedo with another left hand and both men landed one-twos. Pinedo connected with a body kick and a right hand that bloodied Makdessi’s nose, and Makdessi closed out the round with a combination. 10-9 Makdessi. Winner: John Makdessi by Unanimous Decision (30-27, 30-27, 29-28) after three rounds. He improves to 17-6-0. After a cautious opening minute, the fighters traded knees in a brief clinch and da Silva landed straight right hands. Figueiredo threw a spinning back kick and da Silva responded with a spinning backfist. He took Figueiredo down and passed to half-guard. Figueiredo scrambled up to his feet and fought off a throw attempt. Da Silva got him down on his second try and closed out the round with punches and elbows from mount. 10-9 da Silva. Da Silva ducked under a looping hook from Figueiredo and countered with two punches of his own in round two. He targeted Figueiredo’s body with kicks and took him down soon after. Da Silva struck from the top for more than two minutes until Figueiredo opened a bad gash above da Silva’s left eye with an elbow from the bottom. An upkick and another elbow scored for Figueiredo, but a bloodied da Silva kept the pressure on with strikes from the top until the end of the round. 10-9 da Silva. Punches were exchanged in the final round and da Silva looked to set up a takedown from the clinch. Figueiredo repeatedly thwarted his efforts, but da Silva scored with a nice one-two while circling on the outside and he avoided Figueiredo’s strikes. Da Silva eventually got Figueiredo down and he peppered him with punches after moving to mount. Figueiredo gave up his back while scrambling up to his feet, but he managed to break free from da Silva’s grasp. Da Silva landed a spinning backfist and an elbow, and tried for another takedown before the bell. 10-9 da Silva. Winner: Jussier da Silva by Unanimous Decision (30-27, 29-28, 29-28) after three rounds. He improves to 23-5-0. Peterson closed the distance and clinched early in round one, and he took Pena down to the mat. Pena used a kimura to set up a reversal, but Peterson countered from his back with an armbar attempt. Pena slammed his way free and struck from the top. Peterson scrambled back up to his feet, but he ate a hard left hand and a knee on the way up. More punches landed for Pena as he clinched with Peterson against the fence. The fighters separated and Peterson landed a right hand to the body and a leg kick. Pena responded with a flying knee and he fought off a late-round clinch with a knee and a quick flurry. 10-9 Pena. Pena picked his shots with quick punches and a leg kick in the second round, but Peterson secured a takedown and he transitioned to Pena’s back. Pena stood and shook Peterson off, then scored with left hooks and knees. Peterson took Pena down two more times and hopped on his back again. Pena turned into the clinch and he landed heavy punches and a knee after breaking free. Jabs and straight punches landed for Pena until Peterson clinched once more. Pena reversed the clinch and landed some solid shots before time expired. 10-9 Pena. Pena landed two big uppercuts and a head kick in the final round, but Peterson was relentless and he walked through Pena’s punching combinations in order to clinch against the cage. Pena broke free with a knee and Peterson responded with a leg kick. He took Pena down and fought off a straight armbar attempt. Pena swept by using an omoplata to roll through and he wound up on top in Peterson’s guard. Peterson attacked with an armbar and he landed a hard upkick soon after. Pena avoided a heel hook and landed a vicious head kick as Peterson stood up. Peterson somehow remained on his feet and walked forward in search of a takedown. Pena stuffed it and he landed punches until the final bell. 10-9 Pena. Winner: Luis Pena by Unanimous Decision (30-27, 30-27, 30-27) after three rounds. He improves to 6-1-0. Aldrich pressed forward right away and landed a body kick, which was answered by a head kick from Barber. Aldrich dropped her with a left hook, but Barber recovered quickly and returned to her feet. A big left hand landed for Barber and Aldrich replied with a lead right hook. She cracked Barber with a hard one-two and she followed with more lead right hooks. A stiff jab snapped Barber’s head back and Aldrich knocked her down again after catching a kick. Barber stood and landed an elbow that was answered by a right-left combo from Aldrich. 10-9 Aldrich. Barber opened round two with body kicks and she immediately ate another hard left cross from Aldrich. The fighters traded knees in a clinch and Aldrich knocked Barber off-balance with a right hook behind the ear. Big left hands were exchanged and Barber scored with two elbows in close. She stunned Aldrich with a left cross and swarmed on her with more punches. Aldrich remained on her feet and recovered as she clinched against the cage. Barber hurt her again with punches that caused Aldrich’s left eye to swell up. Aldrich wilted against the cage as Barber unloaded with punches and a knee that prompted referee Keith Peterson to wave off the fight. Winner: Maycee Barber by TKO (Punches & Knee) at 3:01 of round two. She improves to 7-0-0.